Ms. CLEMENTINE, Chocolate, Coconut, Ginger and Almonds. Recently, a reliable favourite got another invite to dance on our palate. This time however, the dance instructor decided it was time to step it up. Time to add some twists and mix it up a little more. Could this gluten-free cake get even better than it already was? Well, not better...just slightly different with exceptional results! Let's take a moment to back up to the basic two-step. 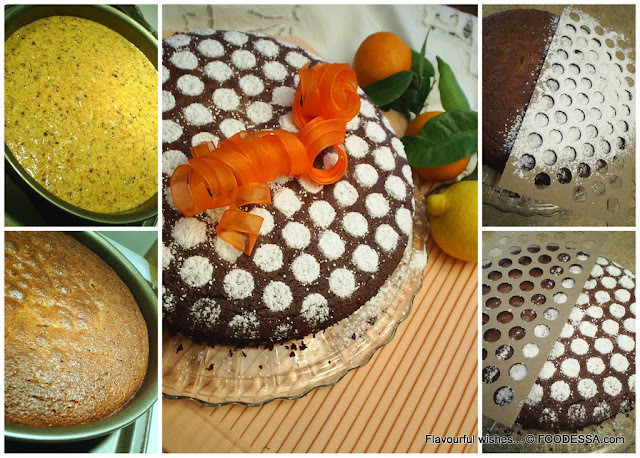 I made this aromatic cake, it turned out to be an incredibly delicious success. it received an extra injection of character so that my expectations could be met! it was a loud message to make that remarkably delightful torte once more! How could I not make this successful sweet treat again? I was getting another chance to perfect the dance routine. Yes, at times it does end up biting me in the you know what?!? But, not this time my friends. I managed to spice it up just enough to carry it to the next level of excellence. I had accomplished what I had set out when shaking things up came to mind.
. as well as an increased dose of pure vanilla essence. my little happy dance had begun. delicately devoured one appreciative bite at the time. * Clementine (a Mandarin orange variety) substitutes: Mandarin, Tangerines, Tangelos and thin-skin Valencias can be used. Preparation and baking time: 90 min.
. After having carefully washed, scrubbed and rinsed the fruits...place them into a medium saucepan and cover with cold water. Bring the water to a boil. After which, the heat has to be lowered to have them slowly simmer (low-medium setting) for 60 minutes. Make sure to put the lid onto the pot for the whole cooking duration. When the time is up, turn off the heat and keep the lid on for another 30 minutes. Afterwards, strain the cooked fruits and let them cool completely for about 2 hours. Set aside temporarily if making the cake the same day or refrigerate if making the cake the next day.
. Lightly grease the spring form pan and line the bottom part with a cut-out circle from parchment paper. Set aside onto a (non-insulated) baking cookie sheet.
. If almonds were not pre-ground...do so in a powerful blender or food processor along with the ginger, chocolate, sugar and coconut. Add also the baking powder and salt towards the end. Remove these ingredients into a large bowl and set aside.
. 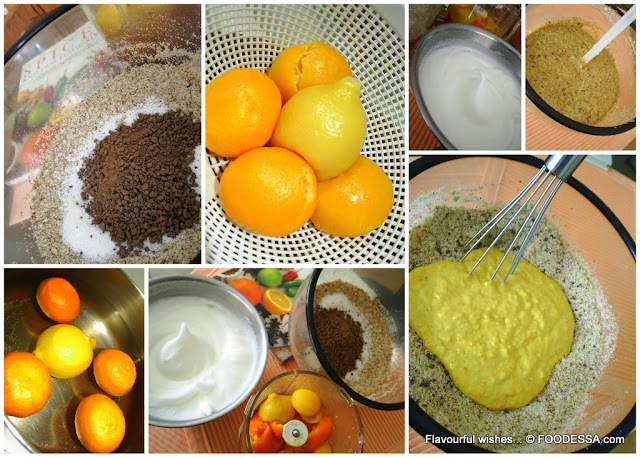 In the same blender or food processor, place the cooked citrus and their peels (making sure any seeds are extracted) along with the egg yolks and the vanilla extract. Process until smooth. Set aside. Meanwhile...in a separate, medium bowl...whip the egg whites until stiff peaks appear.
. Incorporate the wet mix into the dry mix and hand whisk until batter is combined. With a spatula, gently fold and blend the whipped egg whites into the batter until well combined. Do not over-mix. Pour the batter into the prepared spring form pan.
. For about 50 minutes if baking in a dark pan or 55 min. in a lighter pan. Close the oven and leave for another 10 minutes undisturbed. Note: At first, cracks may appear on the surface which will eventually sink back down without initial cracks. Remove the cake pan from the oven. Place on wire rack to completely cool (at least 3 hours). Before unclasping the cake pan, run a knife around the perimeter. Place a plate on the surface and flip it over. Now, unclasp the cake pan. Remove the bottom part with its paper liner. Place your chosen serving dish and flip it over once more to reveal the final result. ...Decoration (optional): Sift and spread the icing sugar over the cake with an optional decorative stencil. Note: If your wondering where I got this template...it came from a 'BINGO' game set with cardboard chips snapped out of it.
. If you can imagine, this cake gets even better as every day passes. The intense flavours have enough time to blend with each other in order to give you a smooth morsel of this delicious torte every time.
. It keeps well at room temperature for 2-3 days. Refrigerate for up to 1 week, take out and serve at room temperature. Or, better yet, warm up the cake on very low heat in the oven as your home will get that wonderful aroma once again. This torte also freezes very well for up to 1 month. Package it in a parchment paper and then slip into an airtight freezer plastic bag. Serve and enjoy. This torte is an exceptional elegant ‘waltz’. Any line-dancer would have to surely slow down their step to savour every morsel.